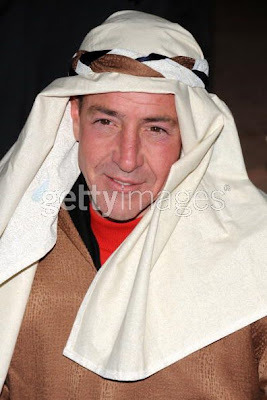 Michael Lohan, train-wreck father of Lindsay No Pants Lohan, has been keeping busy and sober lately. 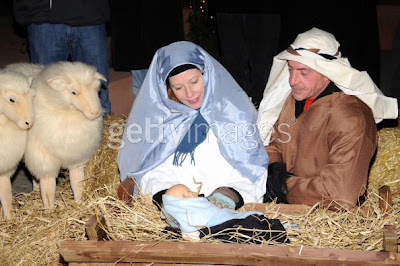 Typically, being sober makes people somewhat boring (i.e Lindsay), but Michael seems to like to really up the crazy factor by showing his love for the baby Jesus by taking part in the 2nd Annual Nativity right smack dab in the middle of Times Square. 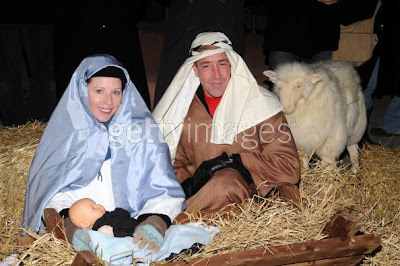 In case you need this cleared up, Michael Lohan is playing the role of Joseph. I’m sure the real Jesus is psyched by this the same way that I’m sure my dad would be honored if Ike Turner played the role of him. Anyway, if this was supposed to be a real Nativity scene will someone refresh my memory if Joseph wore shiny black leather gloves while his son, Jesus, was being born? Also, was the baby Jesus born with a black bullet proof vest? I’ve checked my Bible a few times, but couldn’t seem to find this information in there. Someone Google, please.